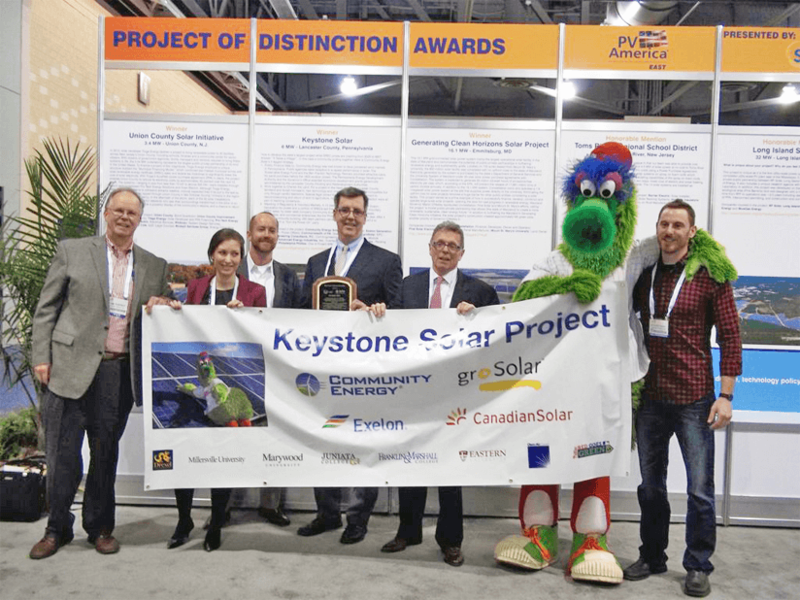 The Solar Energy Industries Association (SEIA)® and the Solar Electric Power Association (SEPA) today announced the three winners of the 2013 Photovoltaic (PV) Projects of Distinction Awards at PV America East 2013 in Philadelphia, PA. The Solar Energy Industries Association (SEIA)® and the Solar Electric Power Association (SEPA) today announced the three winners of the 2013 Photovoltaic (PV) Projects of Distinction Awards at PV America East 2013 in Philadelphia, PA. Recognizing major achievements in U.S. PV solar energy, the awards were presented to the Generating Clean Horizons Solar Project, Keystone Solar and the Union County (NJ) Solar Initiative. For the first time, nine projects were awarded honorable mentions in recognition of their impressive accomplishments. More than 100 submissions were evaluated by an independent panel of judges representing associations, consultants, distributors, government, integrators, manufacturers and utilities. To qualify for an award, each project had to be operational and demonstrate a collective benefit to the community and innovative use of policy and financing to enhance the project’s impact. Located on 100 acres leased from Mount St. Mary’s University, this 16.1 megawatt (MW) grid-connected solar power system is one of the largest operational solar facilities in Maryland. The $50 million solar facility was completed with no upfront costs to the state of Maryland, and it demonstrates the potential of public-private partnership to advance renewable energy. This project serves as a prime example of how to successfully finance, develop, construct and operate large-scale solar projects. Constellation, an Exelon company, was the financer, developer, owner and operator; First Solar Electric was the EPC contractor and panel manufacturer; and Mount St. Mary’s University owns the land being leased to Constellation. Electricity generated by the system is purchased by the state’s Department of General Services and the University System of Maryland under 20-year solar power purchase agreements with Constellation. The system is expected to generate 20 million kilowatt hours of emissions-free electricity per year. According to the EPA, this could prevent the release of 17,981 metric tons of carbon dioxide annually. In addition to the 16.1 MW system, Constellation owns and operates a 1.6-megawatt solar power system at the site that supplies power directly to the university. In addition to furthering Maryland’s Generating Clean Horizons initiative, the solar project’s construction created approximately 165 green jobs. The Keystone Solar farm is a tribute to innovative energy marketing and exemplary project development. Developed by Community Energy and built by gro-Solar, Pennsylvania’s largest solar project is secured by a 15-year power purchase agreement (PPA) with Exelon Generation and backed by retail solar purchases by Drexel University, Eastern University, Franklin & Marshall College, Clean Air Council, Juniata College, Marywood University, Millersville University, the Clean Air Council and the Philadelphia Phillies major league baseball franchise. Community Energy worked closely with the fabled Lancaster County farming community and local officials to support both farmland preservation and agricultural soil restoration in the project design, and EPC contractor, groSolar, built the project to those exacting standards. Solar panels were installed on driven posts without concrete to avoid soil disturbance and allow removal at the end of the 25-30 year life of the project, and the site will be maintained with selected cover vegetation to preserve and improve organic soil content. After three years of community building, 250 team partners celebrated on October 16, 2012 with a “Turn the Power On” dedication event. The solar project received financing and funding from the Sustainable Energy Fund and the State of Pennsylvania. The project has 6 megawatts DC capacity and provides approximately 8,000 megawatt hours (MWhs) of clean, fuel-free electricity per year, enough to power over 950 homes. “Keystone Solar brought together the best of the best to build solar at scale in a challenging market. It was a pleasure to join experienced teams, from design, construction, utility, to finance—and everyone delivered. We particularly appreciate our long-term solar partners in colleges and universities that stepped up to buy SRECs and incorporate our PRAXIS solar teaching modules in their studies,” said Brent Alderfer, president and CEO, Community Energy Inc. In 2012, solar developer Tioga Energy undertook a project to bring renewable power to 30 facilities across New Jersey’s Union County, including schools, libraries, and a community center for senior citizens. The 3.34 MW of solar installations represent the largest public-private partnership of its kind in the U.S. Dozens of government agencies, facility managers and vendors were needed to bring these systems to life. To finance the project, Tioga Energy employed a unique structure dubbed the “Municipal Financing Model,” which combined low-interest municipal bonds with state utility and federal tax incentives to significantly lower the cost of solar electricity. With Tioga’s SurePath Solar power purchase agreement (PPA) in place, Union County will receive guaranteed energy savings over the next 15 years, paying rates for electricity that are approximately 50 percent less than those of the local utility. The systems—ranging in size from less than 10 kW to almost 500 kW—were installed through a joint venture between Pro-Tech Energy Solutions and Huen Electric with environmental and engineering management firm Whitman providing design services. Although Tioga Energy designed these systems to withstand extreme weather, nobody expected they’d be put to the test so quickly. Hurricane Sandy ripped through Union County in late October, forcing 13 towns in the region to declare states of emergency. In the aftermath of the storm, each of the 30 solar installations emerged unscathed. The Solar Electric Power Association (SEPA) is an educational non-profit dedicated to helping utilities integrate solar power into their energy portfolios for the benefit of the utility, its customers and the public good. With more than 1,000 utility and solar industry members, SEPA provides unbiased utility solar market intelligence, up-to-date information about technologies and business models, and peer-to-peer interaction. From hosting national events to utility strategies, SEPA helps utilities make smart solar decisions. For more information, visit http://www.solarelectricpower.org.